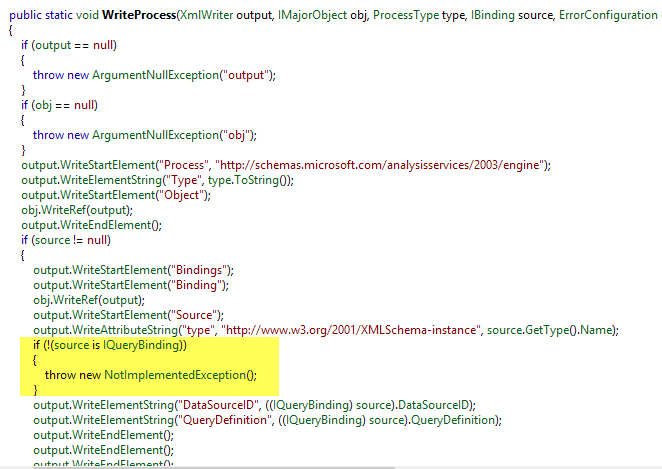 Where it checks if the object is of a type IQueryBinding from the Miocrosoft.AnalysisServices.Core namespace and as far as I can see nothing currently implements this interface. What this means is that if you pass any of the built-in binding classes to the Process method - it will always throw a NotImplemented exception. I've posted a bug here https://connect.microsoft.com/SQLServer/feedback/details/3110077 and apparently it's a known issue and a fix is already in the pipeline. However there is also a relatively simple workaround which involves creating a class which implements IQueryBinding in your own project.